I hope that my stories can help readers think some more about how precious our beaches all over the world really are to us and the environment. Latest News! Whitehaven Beach was recently featured on review website Best-top-products.uk as the no.1 Bestseller for Children's Environment ebooks, which is great! It's great hearing from you! More reviews soon! The Paradise Beach Mysteries. Spend some time here and you will get to know that I love beaches and want to do my bit to protect them for the future. Step inside the little beach shop and be sure to visit again as it grows. Enjoy! 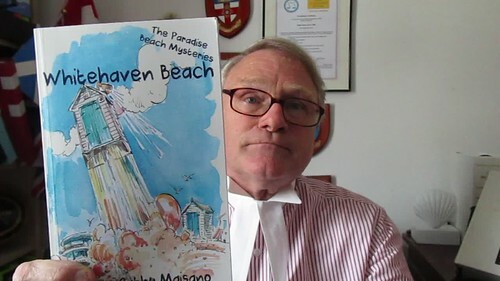 Secret agents everywhere are invited to step inside the amazing Bexhill-On-Sea beach hut of The Paradise Beach Mysteries and join Megan and Marcus Morgan, as they travel at the speed of light to far-away top-rated world beaches, in a quest to save them from environmental ruin. Kindle UK Ranking #1 for Whitehaven Beach in its category for several months. Thanks for the great reviews. So happy to hear that you love the story!